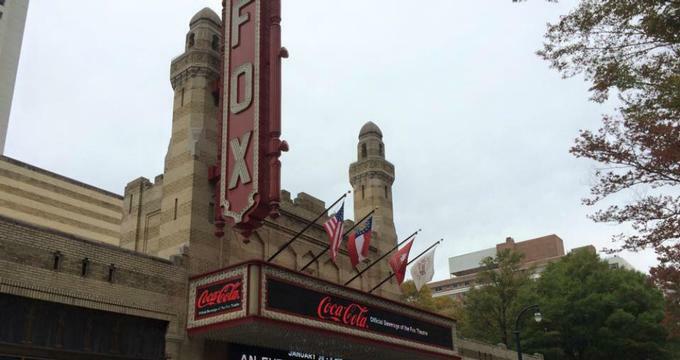 One of the premiere venues in Atlanta for entertainment, the historic Fox Theatre plays host to over 150 performances every year, from movies to Broadway shows to comedy to rock. In addition to its 4,665 seat theatre, the "Fabulous Fox" includes amazing ballrooms that host a wide array of events. Situated in the heart of Atlanta, the theatre is recognized on the National Register of Historic Places. It is a beloved landmark to its thousands of visitors each year because of the memories it holds. In addition to providing a variety of entertainment, the Fox Theatre offers 60-minute guided tours that feature the Fox's must-see intricate details, as well as its history. During the tour, guests visit more than ten locations throughout the theatre. Highlights include the orchestra pit and "Mighty Mo," the world's largest functioning Moller theatre organ. The Fox Theatre's incredible back story how citizens of Atlanta came together to save the theatre from being demolished is also told during the tour. The story of the Fox Theatre's journey to a world-renowned venue started in an unusual way. The Fox was originally planned on as the home of the city's Shriners organization in 1928. Wanting to build a headquarters that was fit for the organization's prominent status, the group looked to the Far East's ancient temples to inspire them to create a mosque-style building. Architectural treasures such as Spain's Alhambra and the Temple of Kharnak in Egypt greatly influenced the Fox's intensely ornate and elaborate design. Features of the design included sweeping archways, minarets, brilliant gold leaf details, and soaring domes. The design became too much though, and the Shriners could no longer afford the building. Upon nearing its completion, the organization leased their stunning auditorium to movie mogul William Fox. Fox had created an empire of theatres throughout the United States to satisfy the country's new love of moving pictures. With the financial backing from Fox, the theatre was finished, complete with addition of "Mighty Mo." On December 25, 1929, the Fox Theatre opened to a sold-out audience. It premiered Disney's first Mickey Mouse cartoon, Steamboat Willie. Word about the beautiful new theatre spread, and more visitors began to flock to the Fox's red-carpet entryway. The stained glass windows, a cobalt "sky" with twinkling stars, turreted ceiling, and ornate gilt work were all perfect accents for the glamorous shows the theatre hosted. The Fox Theatre now plays host to a vast array of headlining productions, and has become a legend. Unforgettable performances from a variety of performers have been showcased at the "Fabulous Fox," such as Elvis Presley and Madonna, as well as the world premiere of the touring production of The Phantom of the Opera. Over 250 performances are shown at the theatre each year to half a million guests. The Fox has also been ranked as one on North America's top three theatres for the past decade.